If we are going to confront climate change effectively, said Radley Horton, an associate research professor at Lamont Doherty Earth Observatory (LDEO) of Columbia University, scientists need to translate their work and “co-generate” ideas in cooperation with powerful actors in society. “We have to meet them in their decision-making context,” he said. Horton will be speaking at a May 4 conference hosted by LDEO, Columbia’s Tamer Center for Social Enterprise, and the Paul Milstein Center for Real Estate at Columbia Business School, “Ice Sheets and Sea Level Rise: Implications for Coastal Property,” during a portion of the proceedings that includes Geoffrey Heal and Christopher Mayer, two professors from the Columbia Business School. The climate scientist is not only collaborating with academics in various fields, but regularly organizes forums that bring government employees and members of the business community into the discussion about climate change. On May 4 Horton, Heal, and Mayer will link the forces behind sea level rise with why they matter to coastal property. “The creeping change in sea level rapidly produces large changes in flooding events,” he noted. “Even if the storms themselves don’t change, a two-foot rise is a virtual certainty by the end of the century.” This certainty, he said, is going to turn events that we now see only once in 100 years into events that occur once every 30 years, which is to say, more than once in a lifetime. Furthermore, in the future, a storm event of a given magnitude is going to cause more extensive flooding. Horton’s work has focused on bringing the effects of sea level rise—direct and indirect—to the attention of decision-makers and to fostering a discussion that leads to a newly informed perspective. For example, Horton said that it is a mistake to focus exclusively on particular buildings within a flood zone. He urges governments, businesses, and investors to instead think more about systemic risks. What will be the effect of saltwater incursion on groundwater resources? What should be done about the inundation of infrastructure, such as sewer networks and railroad lines? “Systems like that are only as strong as their weakest links,” he said. Another shift involves our view of property values. Historically, according to Horton, the question has been “Will property values hold up until the water arrives?” Now, for a particular parcel, he said people are beginning to “price in” the likelihood of flooding. Consequently, the value of land may drop before it is actually wet. Much attention has focused on the damage caused by large storms, but what about normal high-water events? Higher than average tides that occur at regular intervals will become even more common, Horton said, and their reach more extensive. “People think, ‘A couple of times of year is OK,’ but what about when it becomes more common?” At what point, he asked, does it become something we have to do something about? “In an ideal world,” the research professor said, “scientists could reduce uncertainties, and ultimately we will. But we have other roles.” According to Horton, it is the responsibility of the scientific community to help decision-makers envision scenarios and to outline where the thresholds are as sea level rise continues. “We also need to help people understand the baseline,” he said. How did earth systems work before accelerated anthropogenic climate change? Horton and his colleagues—he has affiliations with LDEO, NASA Goddard Institute for Space Studies, the Northeast Climate Science Center at the University of Massachusetts, the National Geographic, and a host of other entities in and outside academia—work with governments and the business community to address the consequences of sea level rise. He has been working with New York City for the past decade to help formulate responses to “low probability, high consequence outcomes” but also to the inevitable inundation of infrastructure. At least one-third of LaGuardia Airport will be underwater by the end of the century. Horton is also involved in a National Oceanic and Atmospheric Administration (NOAA) project that is advising communities in the Philadelphia to New York corridor as to how to make civic plans in response to climate change. He said that these communities could very well serve as models for others who are not as far along. How Will Climate Change Impact Shelter? from Lamont Doherty on Vimeo. In this video, Radley Horton and his colleagues discuss how the frequency and intensity of extreme weather events will change with global warming, and how fast and how far sea levels will rise. Not all plans will involve building bulwarks to save existing infrastructure. 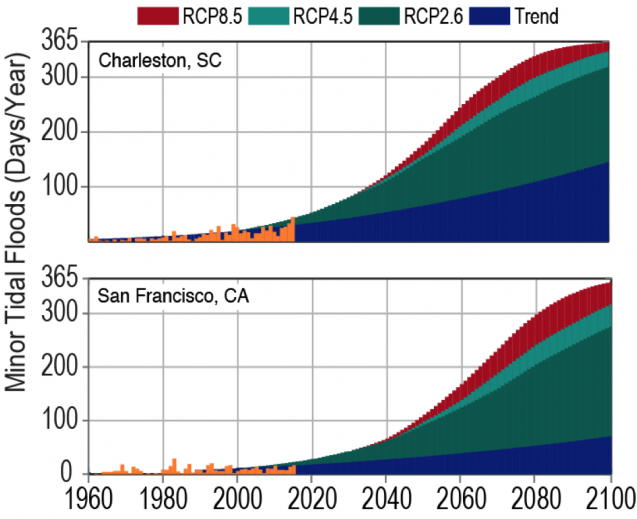 Retreat from the coastline is inevitable, Horton predicted, in some places, like the Gulf Coast, because of a combination of sea level rise and regional sinking. “In parts of south Florida, for example, a seawall won’t work,” said the climate scientist, “because the sea will simply seep through the porous limestone bedrock.” And in some locations, he said, they will not be able to afford the infrastructure necessary to hold back the sea. “In the aggregate, it’s all about cost,” Horton continued, “but there will be a lot of opportunities.” Post-Sandy New York City has put 250 different plans in place including those that deploy “green infrastructure,” buyouts of vulnerable properties, and the construction of seawalls. In the Miami area roads and other infrastructure are being elevated. Boston has already raised its Deer Island wastewater treatment plant. The world of business has long known that sharing information is important. They even coined the term “silo mentality” to describe its negative consequences. The May 4 conference at the Tamer Center will bring together climate scientists, business school professors, and members of the non-profit and business communities to discuss the risks posed by sea level rise.